Das Spiel selbst bietet jede Menge Archimedes-Innovationen, sieht man von der sehr schnellen und farbenfrohen Vektorgrafik ab. Auffällig sind extrem häufige Begegnungen mit anderen Raumschiffen. Man trifft beispielsweise tatsächlich auf "Belters", einige Schiffe, die in Asteroidenfeldern herumtollen, um Mineralien zu sammeln. Wer einen Archimedes sein eigen nennt, muß Elite haben! The line graphics do appear to be rather slower than on the BBC when there are a large number of objects on screen - but who cares? [Re-release] David Braben's famous space trading game is an open-ended adventure where you choose a strategy and then search the galaxy for booty. The more conservative route to financial well-being is trading but the cavalier path is that of space brigand. Great 3D visuals and the opportunity to shoot it out in the skies ensure that it will not be forgotten. Plus the fact that it keeps cropping up on compilations. For the price you get a disc or cassette, a flight manual (borrowed in places from the HHGTTG), a small novelette of dubious use and a literary standing, and a couple of reference cards summarizing the 51 command keys you can use. The whole thing is beautifully packaged in a high gloss, low-tech cardboard box. Although parts of the game seem very slow, I suppose this is acceptable because light year space travel must be immensely boring at times. All things considered the Elite package is unbeatable value and every home should have one. I play throughout the day. I play into the night. Have they done it? Yes! So if you want to live this adventure, join the Elite, and one day, with years of experience behind us, we'll meet on a space station in some galaxy far from our starting point and swap stories of space trading. Trying to review this program in the space available here is like trying to get a gallon in a pint pot! This program has been hailed as a megagame and certainly tries to live up to that title. Addictive? This game could wreck relationships of every kind; beware! Frankly a program no self-respecting Spectrum owner can afford to be without. Brilliant on the Beeb, it's even better on the Commodore with music - the Blue Danube a la 2001 when docking. Elite ist ein Spiel, das bisher jeden, einschließlich der Tester, begeisterte. Elite ist eine abwechslungsreiche und sehr komplexe Mischung aus Raumschiff-Simulator, Handels- und nicht zuletzt Action-Spiel. Elite hat eine fantastisch schnelle und gute 3D-Grafik. Elite mutet auf den ersten Blick nicht sonderlich komplex an, bietet aber schon nach kurzer Zeit eine Fülle von Entscheidungsmöglichkeiten und viel Spieltiefe. Die sehr flotte – wenn auch recht schlichte – Vektorgrafik entschädigt für den kargen Sound. Elite ist einfach genial und stellt sogar noch in 64- und 32-Bit-Zeiten ein Kaufargument für das NES dar. The Cobra's huge engines moan into life as you sit tensely at the controls waiting to be shot out of the space station. Your ship is the best of the medium-range, medium capacity, fighter traders and is ideal for transporting legal and illegal cargoes across the universe. It incorporates defensive screens, pulse lasers and missile launch facilities, while also being able to handle the jump to hyperspace. Once you have cleared the Coriolis space station, orbiting around the planet Lave, you can look out into space, turning your 3D display window to look at the star fields. The game is so complex it seems that you have entered a completely different system. Everything is so detailed: planets, buy different things for different reasons, pirates carry the cargo that they would have bought in the nearest station and every piece of equipment has a make and trade history. Once you start getting into the game you find yourself learning all the makes! All the refinements that have been made since the 8-bit versions mean that the original trade and combat game has lost none of it's appeal. It's even better than Starglider 2. I broke into a sweat as Elite loaded into the 64. Would it live up to expectations? Could I survive in the murderous space lanes? As I settled down in my executive class comfy swivel chair I knew I was about to experience the game of a lifetime. BBC Elite is a classic, the kind of game you will tell your grandchildren about... "I remember when 32k was a lot of ram". Amiga Elite has a number of new features - reverse thrusters to make docking a shade easier, medical supplies have been added to the items in which you can trade, there are five missions - taken from all the previous versions. Amiga Elite is the best yet. One of the best Nes games ever! It's easy enough for anyone to play but tough enough to keep you at it for months. Elite is simply brilliant! [Expanded version] Elite is an excellent game. One of the few that can really be called a 'classic' and probably the only 'classic' that is still playable - especially two years after release. The slightly lower price makes this very good value for money and it is worth getting just for the extra versions of the game. With Elite II on the horizon there's bound to be renewed interest in this ancient classic. Still the greatest game of all time. The gameplay is wonderfully addictive and really does succeed in taking you into a new world of challenge and danger. This is definitely a game that no-one who owns a computer should be without. Take my advice, buy it and you probably won't be seen for six months. 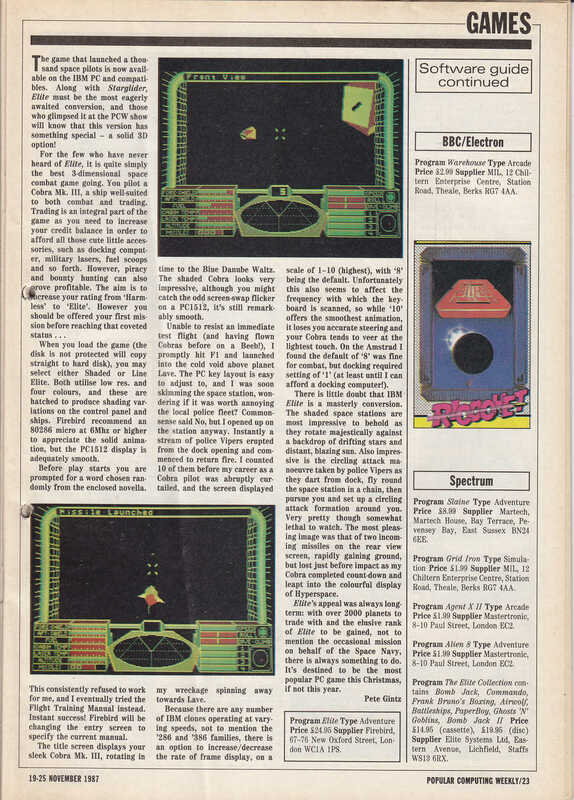 Starting life on the BBC, Elite was converted for the Commodore and, has just appeared for the Spectrum, a mere three months late. It will go down in history as the first major piece of software to be supplied with the Lenslock protection device - a cunning way of preventing piracy by supplying a plastic decoding lens which is used to discover the encrypted access code for the game. In essence, after loading you need to look through the lens onto the screen in order to see the code letters which must be input before the program will RUN. The cassette is also accompanied by a slim novella which sets the scene. The music and sound effects have been considerably improved. Otherwise very similar to the ST and glorious to play. Dieses Spiel wird jeden begeistern, der sich auch nur im entferntesten für Strategie- oder Actionspiele interessiert, denn ELITE bietet für jeden was und zeigt eindrucksvoll, wie intelligent Computerspiele sein können. Toll! [Sci-Fi roundup] Featuring filled vector graphic, space dogfights and risk-taking strategy, Elite is a nebulae of excitement and an undoubted classic. A classic computer game makes the transition to the NES perfectly! A truly original game, Elite offers months of excitement packed gameplay. The basic format is still the same - and as wonderful as ever. It's got much more competition these days and no longer looks leading edge in terms of gameplay or programming, but it still has the essential addictive ingredients of a great game. The lack of a keyboard does hamper the game somewhat (it was ported from the PC), but it does have handy onscreen icons to assist. This staggering open-ended game requires weeks if not months of attention. Elite is vast, complex and very, very absorbing. I've got bulging, red eyeballs from staying up into the early hours but I don't care. I'm going to continue playing until I'm ranked Elite ... or at least Competent ... or even Average ... Buy it! [Disk version] Elite is an excellent game. One of the few that can really be called a 'classic' and probably the only 'classic' that is still playable - especially two years after release. The slightly lower price makes this very good value for money and it is worth getting just for the extra versions of the game. The Commodore 64 version is a faithful copy, only differing in one or two minor areas. You should be this compilation for Elite alone. It's a classic Spectrum game, and it's been out of circulation for far too long. What a brilliant game. l loved the 3D wireframe version on the old BBC Micro, but this 3D solid version is stunning. The controls are the same and l was immediately at home, trading, blasting, baiting the police and generally living the life of a pirate among the star systems. This classic game must be on everyone 's Christmas shopping list. Don't miss it. What the game lacks in graphics, it makes up for in playability. Not really any sound, but that's probably because it's space. Make no mistake, Elite is a flippin' cool game. The latest version plays much the same as its predecessors, but there is one important difference - instead of using vector graphics to display the proceedings, everything is presented in solid, shaded 3D. Elite avancierte dank seines komplexen und hochmotivierenden Spielprinzips schon bei der Erstveröffentlichung vor vielen Jahren (C 64) zum Kultspiel, die grafisch konsequent überarbeitete 16 Bit-Version konnte den Erfolg nochmals wiederholen. Das Programm ist zu Recht ein (bisher unerreichtes) Vorbild für eine ganze Generation von Computer-Garnes und darf in keiner Software-Sammlung fehlen! Wer sich nicht in seinen Cobra-Raumer setzt, um Piraten und Thargoiden das Fürchten zu lehren, hat eines der schönsten Spieleerlebnisse der letzten fünf Jahre verpaßt. Die Motivation, nur mal eben ein paar Credits zumachen, um sich einen besseren Laser zu kaufen, ist ungeheuer hoch. These minor faults aside, Elite on the ST represents a competent implementation of a timeless concept. Despite lacking many of the refinements present in Gremlin's FOFT, such as being able to land on some of the planets, Elite remains almost as playable. But it's FOFT that narrowly has the edge on its classic counterpart. Unsurprisingly taking next to no time to convert from the ST, Elite scales new heights with probably the definitive version of the original 1984 game. In graphics and play this is no different to the ST version. The only exception is that Mr Micro have made use of the Blitter, hence slightly faster moving 3-D solids. The Amiga's extensive colours are conspicuous by their absence - shades of blue being the main order of the day. And unfortunately not enough is made of the machine's power. [Tape version] This is a cut down version of the disk game with less equipment available, only five different kinds of enemy, fewer options and less atmosphere (e.g. no descriptions of planets or military lasers). Still a classic among classics, Amiga owners should not hesitate to buy, but there is still the feeling that better use could have been made of the machine's facilities. "Elite" braucht man eigentlich nicht mehr vorzustellen. In dem Klassiker findet man alles, was einem Spielefreak Spaß macht: ein paar Quadratmeilen Weltraum, eine Prise Handel und vor allem viel, viel Action. Wer die ST-Version gesehen oder den Test in POWER PLAY 12/88 gelesen hat, kennt auch schon die Amiga-Version. Elite war schon immer der Klassiker der Software-Branche, ein Programm, von dem man immer nur in Ehrfurcht sprach. Bis heute ist es eines der komplexesten 8-Bit-Spiele – über 2000 verschiedene Planeten sprechen für sich. Die ST- und Amiga-Umsetzungen sind spielerisch dem Original fast identisch nachempfunden. Die Programmierer haben lediglich ein paar neue Spezial-Missionen hinzugefügt. Technisch hat sich aber vieles verbessert: Bunte, ausgefüllte und dennoch flotte 3D-Grafik macht den Flug durch die Galaxis um Klassen schöner als auf dem C 64. Außerdem haben die Programmierer den 16-Bit-Versionen eine flotte Benutzerführung verpaßt, die mit gut gezeichneten Bildchen und einprägsamen Menüs den Griff zum Handbuch fast überflüssig macht. Das 60 Seiten starke, toll geschriebene Handbuch ist übrigens in Deutsch. Wer sich Weihnachten nur ein einziges Spiel für ST oder Amiga kaufen will, sollte zuerst einmal an "Elite" denken - dieses Programm wird Sie auch noch Ostern in Atem halten. Eines der definitiv besten Computerspiele aller Zeiten liegt jetzt endlich für MS-DOS-PCs vor. Das Warten hat sich gelohnt, denn in den letzten Jahren hat Elite kaum etwas von seiner Faszination verloren. Das komplexe Spielprinzip wird hier mit der schnellsten Grafik aller bisher erschienenen Versionen gewürzt, die vor allem auf PCs mit schnellem Prozessor für viel Weltraum-Feeling sorgt. Man bekommt bei Elite auch viel Dokumentation fürs Geld: Ein dickes Handbuch, ein Kurzroman (beide in Englisch), ein Poster und eine Referenzkarte, auf der die umfangreiche Tastaturbelegung zusammengefaßt ist, liegen der Packung bei. Alles in allem eine faszinierende Mischung aus Handels-, Abenteuer- und Action-Spiel, die eigentlich in jede gute PC-Spielesammlung gehört. Despite graphic alterations, the game itself has undergone little change. Five missions have been incorporated, a new item of equipment - Retro Rockets - can be bought and a radar magnification option is given. Apart from these extras, the program structure is similar to the original BBC game. This may disappoint those veteran "Elitists" who were expecting more on the ST, but the games strength lies in its long term appeal and flexibility of play. Die 3D-Grafik der Flug- bzw. Kampfsequenzen weckt Erinnerungen an die alte 64er-Version: Gestirne und Raumschiffe bestehen ans einfarbigen Polygon-Objekten, die sich aber schnell und ruckelfrei bewegen, zudem hat man die Preis-Tabellen und Planeten-Infos grafisch aufgepeppt. Die Soundeffekte sind ordentlich gemacht, auch der berühmte Strauß-Walzer beim Anflug auf die Handelsstationen fehlt nicht — der Einfachheit halber ist der ehemals sündteure Andock-Computer hier schon serienmäßig eingebaut. Daneben sorgen deutsche Screentexte sowie eine tolle Anleitung für Komfort, und die acht speicherbaren Spielstände nehmen dem Raumtod den Schrecken. Fazit: Elite ist auch am NES ein elitäres Programm! My first impression of Amiga Elite was of disappointment. Apart from being filled-in, and having the dubious addition of some gaudy static graphics, the game hasn't been progressed any since the 32k BBC program of 1984. There is so much you could do with the game on a 16-bit machine, yet it's potential remains untapped. However, it is not all doom and gloom: this is without doubt the best version of the game to appear so far, and is even more entertaining than is predecessors. The ST version of Elite is excellent, and boasts superb presentation, fast and smooth gameplay, great graphics and five new missions. Purists will be pleased to know that none of the basic 8-bit gameplay has been changed, and the action is even more enthralling than the original versions. Trading and fighting is a highly enjoyable experience, although the going does get occasionally tedious when you can't use the jump drive due to the presence of other craft. This results in the player having to locate the space station manually, which can take over a quarter of an hour! Another gripe is that the sound is rather feeble - I'm sure the effects could have been a little more meaty. That aside, Elite has enough depth to keep budding space traders engrossed for many months. There are no words to express how amazing this game is despite the hype. The Commodore version is a great improvement over the BBC version. Get it now! Elite is complex and challenging. Its strength is that it appeals on several different levels. It is a flight simulator of some merit, a strategy game requiring careful planning and a damn good shoot-em up all rolled in one. Das Original (Mitte der 80er Jahre veröffentlicht) wurde oft kopiert, aber nie erreicht. So hat die Urvariante, auch wenn sie schon einige Jahre auf dem Buckel hat, noch immer ihren Reiz. 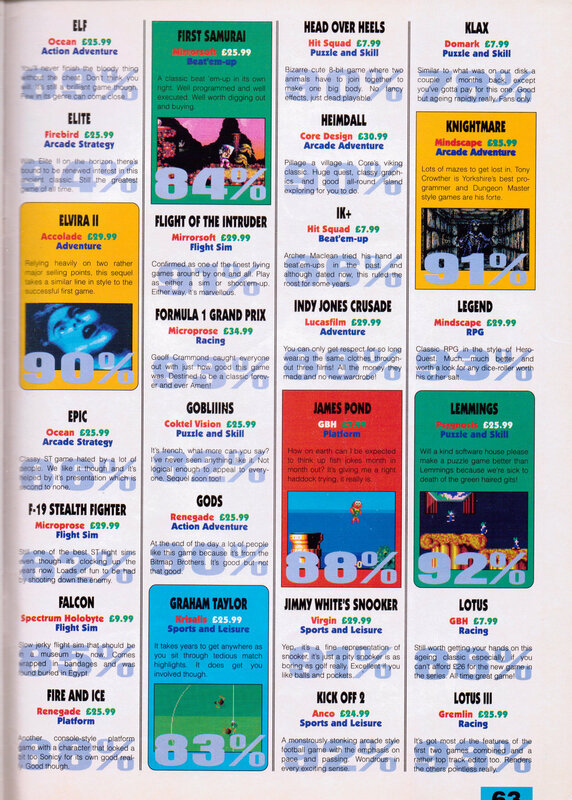 Ein dickes Lob verdient die Umsetzung der flotten Vektorgrafik auf das NES. Wer den Walzer des Andockcomputers hört und sich an die alten Elite-Tage erinnert, wird Nostalgietränen vergießen - das Gedudel klingt identisch. Die Actionsequenzen im Weltraum sind nur etwas für flugsimulatorerprobte Könner. Anfänger seien ausdrücklich gewarnt. Der Zahn der Zeit konnte diesem Evergreen nichts anhaben: Elite bietet auch 1992 noch eine Herausforderung, an der Ihr Euch für Wochen festbeißen könnt. In terms of gameplay, the MSX game is not much different from that on the ST. Graphics are traditionally wireframe, incorporating sparse use of colour. Unfortunately, speed is lacking, on a par with the C64 version. Sound is also as weak as on the ST translation. This lack of use of the MSX and its capabilities means it has to rely more on the gameplay. On any machine the game is a classic and as such deserves a place in any MSX owner's software library. I was looking through my great list 'o NES games when this one caught my eye. "Surely it's not the Elite," thought I. The BBC Micro original is a legend among space sims. How would you ever port it to the piddly old NES? But of course, it was done; otherwise this review wouldn't be here. And though I suppose no one should be surprised that it fit on a cartridge (the original Elite took up just one 5 1/4" floppy after all) it is a bit of a wonder that it runs on the NES, and runs so well. How on earth do I sum up a game as big and as impressive as Elite in a hundred or so words? Easily – just use that old reviewer's cop-out cliché: ”buy it!” The graphics have been brought right up to date; with some of the fastest filled objects ever, and the sound also is well done. With the five missions the task ahead is long and hard, and it is not a game you can just pick up and get straight into. Time must be spent reading the instructions and getting used to the controls, but it will be worth it. Although twenty-five quid is an above average price for an ST game, it will be a wise investment, as Elite is a very above-average computer game! Still, I truly enjoyed the first 20-30 hours I put into this game, and frankly that's more than enough for any gamer to feel they got their money's worth. A great game in its own right, I just can't help but feel how close to perfection they were able to come had they only included more content or an overall "plot". You can't help feeling a sense of nostalgia as Elite boots up and you scan the galaxy for the best deal to be had. If you've never played it before then it's worth buying just to find out what you've been missing all these years. Otherwise it's time to move on. Elite's graphics really are stunning. The opening title features a picture of your craft, which revolves perfectly in full 3D. But fitting all this into the Beeb's limited memory means that sound effects are rare. Fazit: Vor allem die gelungene Benutzerführung und die akzeptable Grafik zeichnen “Elite“ auf dem NES aus. Auch wenn die überragende Qualität der C64-Version bei weitem nicht erreicht wird, handelt es sich dennoch um ein durchaus lohnendes Spiel. Antesten! I really didn't enjoy the game as much as I should have, it didn't feel like Elite because it was all too pretty - with the BBC version the graphics were stark and added to the realism of the whole thing, but here we have all these colourful features that leave nothing to the imagination - sorry gang, I know most people consider this the game of the year for the Amiga, but it was a let down - perhaps less hype next time Firebird? Oh, and will you please stop converting these crappy Atari ST programs. I may have liked this game a bit more if you had at least made an effort to improve the facilities of the game. Thank you and good night. Nie da się dziś jednoznacznie ocenić gry takiej jak Elite. Ponad dwadzieścia lat temu jej oprawa i gameplay zachwycały nowatorskim podejściem, ale dziś naprawdę trudno to docenić. Gra niezbyt dobrze zniosła upływ czasu i dziś mogę ją polecić tylko fanom tego typu kosmicznych symulatorów. Interstellar trade and combat with two thousand planets in eight galaxies, Elite used wire frame graphics to depict space flight. Its popularity was largely a result of being one of the first space games with a "large" universe to explore. Doch jetzt ist „Elite“ wieder in aller Munde, denn der Klassiker wurde für Commodore 64 und Schneider CPC umgesetzt. Das Warten bat sich für Besitzer dieser Computer wirklich gelohnt, denn „Elite“ gehört zum Besten, was je für Spielefans veröffentlicht wurde - ein echtes Kultspiel. It's destined to be the most popular PC game this Christmas, if not this year.